What’s Included: 7 nights, daily breakfast and dinner, group transfer from/to Frankfurt Airport; English-speaking guide, bicycle rental, all entrance fees, support vehicle, and our famous t-shirt. … when thinking about Franconia. You haven’t thought about Franconia? That verdant heart of central Germany, where the Main River makes its leisurely way through an area called God’s Garden, where the towns were founded so long ago that some were Roman, where both beer drinkers and wine drinkers are happy to pilgrimage? If you sign on for “Bicycling & Barging Along the Main River” idyllic will be often on your mind. You’ll find that Main is pronounced “mine” here, and also learn that the locals call themselves Franconians, not Bavarians, although technically Bavaria is the region. 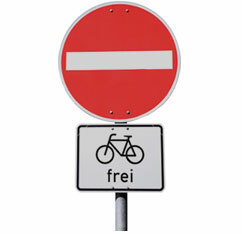 Bicyclists are expected in Franconia; the bicycle paths are asphalt and well-maintained and country roads accommodate transport on four wheels, two wheels or two feet. Our route will follow the river with overnights on our own barge, docked in pretty towns that still have their castles and their half-timbered houses. The usual daily run of 15 to 36 miles will give us a total of around 150 miles traveled when the tour winds up in Aschaffenburg, seven nights from the start. Bamberg, our starting point, is classically perched on seven hills, each hill topped by either church or castle. Before we leave this interesting place we will have a guided tour with a local historian and see why Bamberg is a UNESCO World Heritage Site. (The authentically medieval look is a clue.) Bamberg, almost untouched by World War II damage, has a glorious cathedral anchored by four tall towers and adorned with 13th-century sculptures. Its Gothic town hall is whimsically situated on an island in the river and the Neue Residenz (new in the 17th century, that is), once home to church dignitaries, now opens its elegant rooms to the public. Architecture in Bamberg reflects a thousand years of building. On our way to Hassfurt, we’ll take a look at a pilgrimage church designed by Balthasar Neumann, who redefined Baroque architecture in the mid-18th century. Hassfurt has its own specialties: the Knights’ Chapel, where more than two hundred medieval knights’ coats of arms are displayed, and a parish church adorned with late Gothic works by the master sculptor Tilman Riemenschneider. 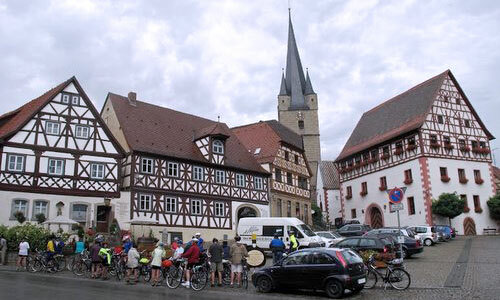 We’re then off to Schweinfurt – the name means swine forded the river here – which had a long history with American military but before that perfected the hydraulic bicycle drum brake, to our biking advantage, and long before that became the site of a Renaissance Town Hall, still functioning. Our barge will dock in Kitzingen where the leaning tower is explained by a story that mortar was mixed with wine, not water, in a 13th-century summer of drought, and also in Wűrzburg where World War II damage has been painstakingly overcome. In our walking tour of Wűrzburg we’ll see its return to architectural eminence and also visit the Bishops’ Residenz and its extraordinary Tiepolo fresco that survived intact. The city today retains its memories of yesterday. Our route takes us from beer country to wine country. 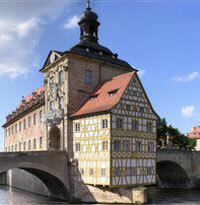 Bamberg has more breweries than Munich and produces a distinctive variety of beers. 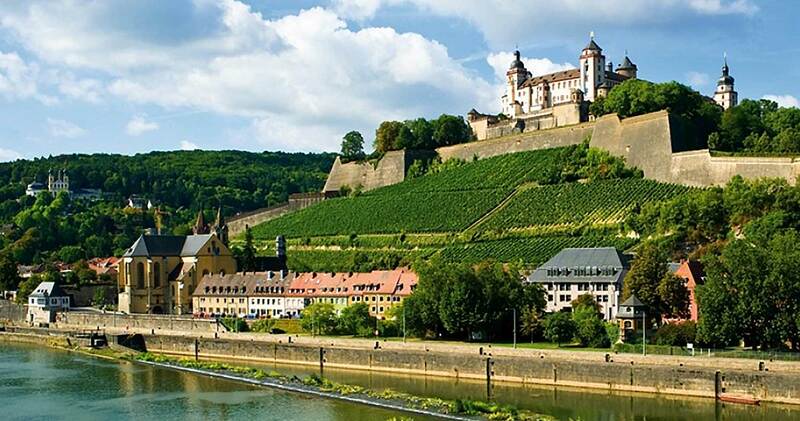 Wűrzberg is in the heart of Franconian wine country and the source for many fine vintages not found elsewhere. The very best are bottled in the rounded, flattened glass container called the Bocksbeutel, reserved for that purpose. On our way to Lohr am Main, where the river takes a temporary bend to the south, we leave the vineyards and move into forested land with mountains in the distance, but our route along the river continues its level way. The next day we move on by barge with time for a leisurely breakfast before disembarking at Wertheim, a village with memories that reach into the Middle Ages. Glassware and beaded jewelry making began then and continue today in the form of industrial fiberglass and scientific glass. From Wertheim we have our last bicycle ride, to the walled and gated town of Miltenberg where the Middle Ages seem to be only yesterday. The streets angle and curve and many houses are partially built of wood as the forests just beyond were communally owned and provided the citizens with timber for the taking. There’s a castle, of course, and the oldest “Prince’s Tavern” in Germany.